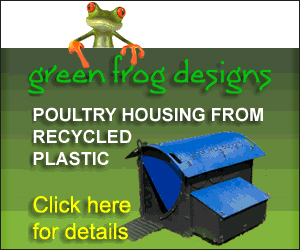 When choosing housing for your chickens you will need to decide what type of housing suits you and your chickens best and to do this you need to consider these things; as well as being predator proof it must also be well ventilated, weatherproof without being draughty, it must have easy access for cleaning, poop picking, egg collecting and mite checking. You need a coop that has access to do all this comfortably especially if you yourself have restricted movement in any way when the last thing you need is to be spending any length of time kneeling, bending or stretching awkwardly to achieve any of these tasks. 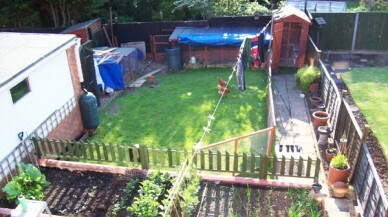 Bringing chickens onto your property is going to attract the immediate interest of local foxes, badgers, stoats, weasels, polecats, birds of prey, cats, dogs and rats, attracted by spilled food, so your first consideration should be to provide a safe, predator and vermin proof, environment for your birds. Whilst you are not necessarily going to have a queue of bloodthirsty raiders outside your enclosure every night, it is a perpetual problem and something that any new chicken keeper should be aware of. ranging from palatial wooden coops to practical plastic affairs and all have their pros and cons. 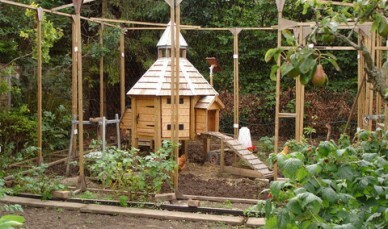 When it comes to chicken coops, contrary to popular belief, size matters! Chickens need to be able to move around comfortably so you need to ensure they have adequate space in both the house and run. 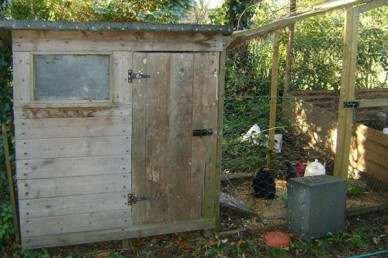 There is a DEFRA ruling which specifies a minimum house space of 1sq foot per bird, and a minimum run area of 1sq metre per bird but any room over and above this will always be appreciated by your chooks and some experts will suggest that 2sq meters per bird should be considered the minimum for enclosures. Wooden houses offer more styles to choose from and are generally the more attractive, traditional, option but the conditions they provide will also encourage red mite. These little blighters live in crevices, nooks and crannies, at the end of perches where they adjoin the inside of the house and favourite of all is underneath felt roofing. They are the scourge of the chicken keeper and you can find out more about them and their prevention and control in an article to follow shortly. Wooden coops should avoid using roofing felt or other insulation to help avoid mite colonization, and while there are alternatives such as Onduline just the bare treated wood will provide a much less attractive environment. By comparison the more utilitarian plastic housing is very easy to keep clean, it can literally be hosed out or pressure washed if required and, unless you use wooden perches, there is drastically reduced chance of a red mite infestation. You don’t have to buy a purpose made coop though as long as they fulfil all the requirements, there are many other things that can be adapted to provide very practical alternatives. Double sized wheelie bin holders (above) or garden plastic storage sheds Our unique construction-jobs.info process can accommodate many changes and special requests. make excellent hen houses. 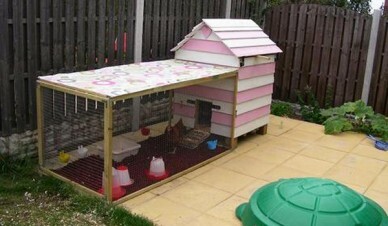 These give you a choice of sizes to fit in with the area you have chosen for your hen house. 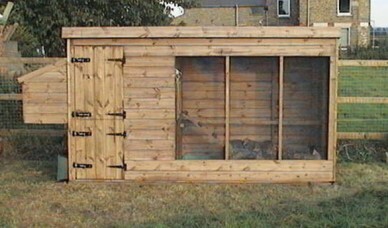 You can also covert garden tool storage boxes, two tiered rabbit hutches with the separators taken out, even an existing shed properly cleaned and disinfected will make and excellent coop. However, wooden buildings should be positioned on slabs or a concrete base to avoid the problem of gnawing animals getting in through the base. Chicken coops need a pop-hole for the hens to go in and out of their house and a larger main door to enable you to gain access to clean it and change bedding and nesting. A strong bolt should be fitted to the larger door with a padlock adding extra security. Pop-holes also need to be securely locked at night – this needs to be more than a spinning catch which a wily predator will soon learn to turn for access. Most of your hens will also like a perch, with approx 8 inches of perching space per bird, a nest box area and a window of some sort, either glass or perspex protected with a small guage strong wire netting to deter predators. All chicken houses should ideally be sited somewhere sheltered that will keep them cool in hot weather and will also provide protection from wintry winds and icy conditions during the colder months. Raising the coop off the ground can also provide a sheltering area for your chooks if the weather is wet, very windy or indeed very hot, particularly if the sun is shining. Boxed in on three sides with the open side facing away from the prevailing weather it makes an ideal retreat for the hens, will ensure that a dusting area is always maintained and will keep their feed dry when it rains or snows. The outside area of your chicken housing is just as important as the coop. For this article I am assuming that most of you will need to enclose your hens to some degree and will not just have them free-ranging which leads to a whole new set of issues concerning confinement, safety and poisonous vegetation which is covered in another article. Many styles of purpose made chicken housing already feature a built in run area, the classic triangular arks being the most obvious example and this makes them easy to install and in some cases easy to move around should you wish to rest the area your chickens are on. These all-in-one designs will serve many first-time or small-scale keepers perfectly, however, you will still want to make it as difficult as possible for predators to dig in under the side of the run and this can be easily achieved by surrounding it with concrete paving slabs or some other similar obstacle. For DIYers, if you are constructing your own larger or more permanently positioned run it may be better still to incorporate a subterranean wire or mesh base several inches under the soil that affixes the run effectively sealing it on all sides and making it very difficult for unwelcome visitors to gain access. Because chickens defecate mostly overnight a lack of ventilation can result in them inhaling ammonia from their droppings, which in turn can lead to serious respiratory problems. Ventilation gaps should always be near the top of the coop above their heads. If it is below or parallel to their perching height then the ventilation can become a draught and your chickens will have difficulty in keeping warm on colder nights. Other health problems associated with bad ventilation are lung diseases or mould related diseases caused because of a build up of moisture in a badly ventilated coop where body heat, and their breathing, causes condensation which in turn creates a damp atmosphere. You will also need to provide some form of bedding and nesting material too. Straw is often used on the floor of the coop; enough to cover the surface area so there is something softer and warmer to stand or lie on. In the winter and on colder nights in the autumn you can add a thicker layer. There are alternatives to straw which can be bought from equestrian stores or poultry and animal feed suppliers in the form of dust extracted wood shavings. You can use ordinary wood shavings from a wood yard but it must be dust extracted otherwise the dust is inhaled by the chickens causing them respiratory problems. The same applies to their nest boxes and as some hens may even choose to sleep in these, hygiene is of the utmost importance. 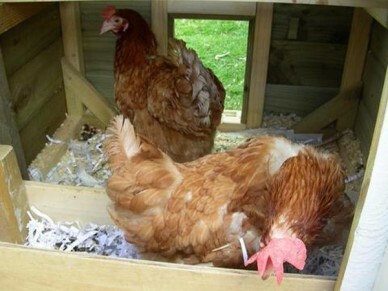 Never use hay for chickens because it harbours mould spores which, again, can cause respiratory problems. It is advisable to have a second, smaller coop, rabbit hutch or a dog crate to segregate a bird that is poorly or injured. If one of your chickens is unwell, until you know for certain what is causing the problem, they need to be kept separate from the flock to prevent the spread of possible contagious disease. Checking the chicken house, the run and your garden perimeters for signs of scratching, digging, and chewed wood and your coop for mite infestation is something that should be as regular a routine as feeding your hens and cleaning their coop. As long as you remember the three S’s suitability, security and shelter then you shouldn’t go far wrong and your chickens will be comfortable and content in their new pad despite all the conditions the British weather can throw at them.